Same for 8550 (94w), 8570 (132w) and 756x (180W). Power-off the system. Remove power supply and place it with connector facing up. Power-on the power supply and check for voltages listed below. If voltages are not correct, check the power cord for continuity. If power cord is good, replace the power supply. NOTE: Sometimes AC power cords develop a set in the plug contacts so that there is intermittent or poor contact with the AC receptacle pins in the PSU. Try reseating or swapping out the AC cord. NOTE: If you have a dead PSU with no voltages, suspect F1 or F2 have blown. This PSU has an external, two pin Molex connector that provides power to the case fan. There is a 9.25"Wx1.75"H inch hinged cover on the lower outer side of the psu. It is fastened at the front by a single captive standard screw. The cover pivots open on the rear hinges, revealing a three pin Molex power connector, like a female drive power connector. The battery cavity is 1.875" deep. ASTEC, Model AA15530, IBM PN 90X9409, FRU 90X8626. Max continuous output power is 132 watts for the 8570 PSU. Max continuous output power is 94 W.
This is from a 50Z. No side blower. (The blower plugs into the motherboard, is supported by two plastic snaps to top rack, and it blows out the rear of the 50/50z unit). CASE BOTTOM of power supply does not have a screen, it has finely punched holes, 11 or 10 holes across, the length of power supply. Cases vary color, gold/silver. Security torx, 5 on side 2 on top. Like unto Mod 70 supplies, except no side blower, and lower rating. Remove the two screws at the back of the case. Remove the screw at the front inner corner. Pull PS out from planar. As always, there is a horizontal tab at the front for a standard screw. IBM even put a nice access hole through the drive shelf so you can get to it while the system is assembled. Two standard screws at the back to pull the PSU back onto the rear of the unit. With those three standard screws out, the PSU slides out horizontally, off of the planar power connector edgecard. To open, get a security T15 Torx bit (tip is drilled out to mate with pin), remove the Torx screws. One Torx screw at the upper rear inner side has a toothed lock washer. To undo the mating clam shell, note the retaining rib top center. Use a small screwdriver to get under the sheetmetal and pull the halves apart. The inner cover with the fan pivots on tabs at the lower inner side. The fan is still connected to a power tap. Pull the cable straight out and the fan/cover is now free. Put aside. You can pivot the edgecard connector out of the bottom edge of the PSU by SIMMply pulling UP at the rear of it, and then BACK on it. Oddly, the two security T10 screws on the black plastic only seem to tighten the connector onto the post, leaving the edgecard connector free to move in four directions, but it's mounting does not allow it to pull out or be pushed in. Makes sense, this allows for greater freedom during automated assembly. Once you pull the edgecard connector free, you will see F1 and F2 in the lower left corner of the PSU PCB (toward the AC socket). The power supply has TWO fuses, one on the Hot, the other on the Neutral. ASTEC called it "Double Pole / Neutral Fusing". ASTEC part number is ASTEC 084-00300030-0217. It is a BEL 3AG, 5A 250V Fast Blow. Current BEL product is 3AG 5-R 3AG is a 6x32mm cartridge form. The three resistor/capacitor pairs on the riser are for DC-buffering and decoupling. The earlier risers lacked them and once you'd stuffed in 2 FDDs or 1 FDD and a tape problems occured with loss of data during copying and suchlike. 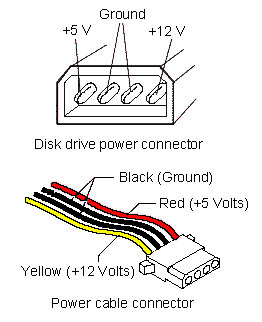 Please note that clone PC power cables use yellow/black/red, while IBM systems use yellow/black, or red/black/blue. What is important is the position of the conductor. Note that the drive power connector is keyed with beveled edges. The maximum power from this hack is about 5v/1A and 12v/1A so if you have both disk-drives or one disk-drive and a tape-streamer installed ... it is probably not a good idea anyway. It will -non the less- work in most cases, until the unit driven over this port doesn't take too much power. Most modern Harddisks will not exceed these limits. In case of doubt: consult drive manual for its power-consumption. Or don't do the modification. If you have only one disk-drive installed, take the connector of the second drive for modification. Caution!! Take care not to damage the tiny connections on the board near the connector for Drive 2 while soldering the wires. Remember, that the Mod. 50 / Mod. 70 power-supplies aren't that powerful at all. Especially the Mod. 50 power-supply (94W!!!) is known to have lesser power than assumed. If you'd already installed a -386/-486 upgrade, 64Megs of RAM, SCSI-adapter and a Hi-Resolution graphic board it will surely collapse.